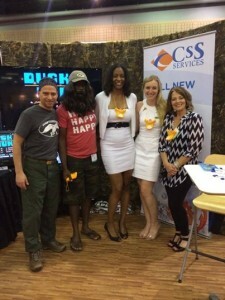 This year to follow the theme of “Reality TV” the sales staff dressed as the cast of Duck Dynasty, fully embracing the theme our very own Efa Mboto was seen proudly displaying his full beard and long hair. We were happy to see such a great turn out from this event, and had such a wonderful time connecting with many of our current and potential customers. One of the biggest draws to our booth this year was Duck Hunt! The classic Nintendo game was a nostalgic piece that was enjoyed by many, and the duck calls could be heard across the trade show floor. In closing we would like to thank everyone who stopped by our booth this year, we hope that you enjoyed the show just as much as we did!